More Stories on South L.A. The Portrait of L.A. County shows us the manifestation of inequity across our communities. An analysis of life expectancy across local communities reveals stark disadvantages and vulnerabilities, many of which are rooted in historic (and ongoing) policies and practices, also known as “structural” and “systemic” inequities. Over time, interpersonal and institutional biases in policies and practices have tended to “sort” populations into resource rich and resource-poor communities. For example, historical discriminatory housing practices such as redlining exacerbated racial and ethnic segregation, restricted access to decent housing and homeownership, and contributed to wide gaps in the allocation of educational resources that we see today in L.A. County. Variations in life expectancy stem from what public health professionals refer to as the social determinants of health. Such factors include everything from education levels, income, and employment to social connectivity and exposure to trauma, violence and crime. The impact of social determinants of health is not limited to life expectancy — they affect nearly all health outcomes. In the Portrait of L.A. County, West Adams-Baldwin Hills-Leimert and View Park-Windsor Hills are two neighboring areas in South Los Angeles with large Black and Latino populations and similar household sizes according to 2016 American Community Survey (ACS) 5-year estimates. Both areas have an average household size of just under 3 people, and 86% of their respective populations identifies as Black or Latino. 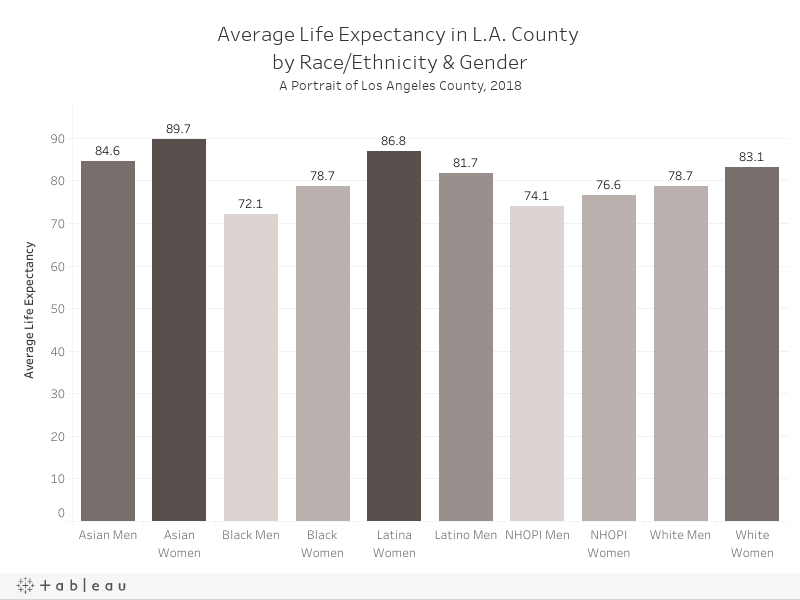 Despite their geographic proximity and demographic similarities, Portrait of L.A. County reports that life expectancy in the two areas differs by more than 4 years, with View Park-Windsor Hills’ life expectancy averaging 83 years while West Adams-Baldwin Hills-Leimert’s life expectancy rests at 79. Some of the major determinants that may contribute to this gap include income and educational attainment levels. According to 2016 ACS 5-year estimates, View Park-Windsor Hills has a median household income of $85,974 — more than double that of West Adams-Baldwin Hills-Leimert ($39,947). A similar gap in college graduation rates exists between these two communities. Over half of View Park-Windsor Hills residents have a bachelor's degree or higher level of education compared to just 21% of residents in West Adams-Baldwin Hills-Leimert. 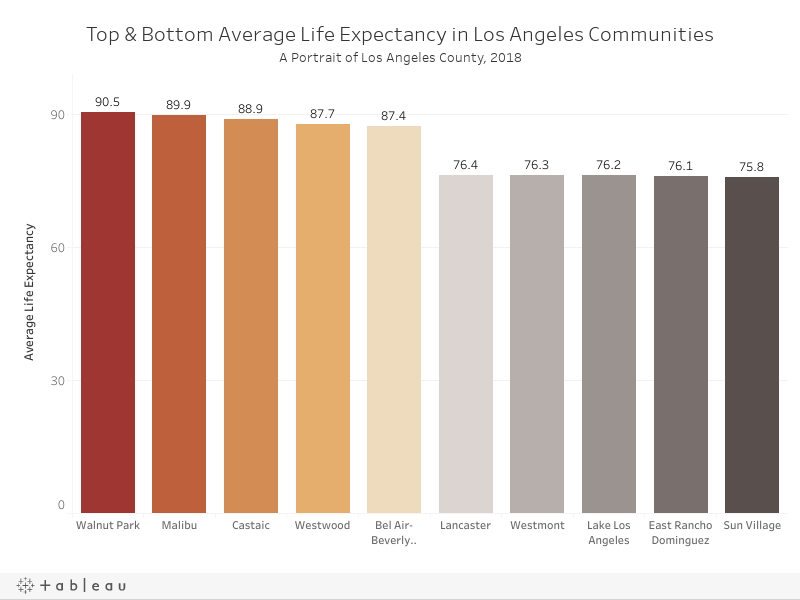 In addition to socioeconomic status, View Park-Windsor Hills and West Adams-Baldwin Hills-Leimert differ in other important ways that impact life expectancy. The Portrait of L.A. County identifies access to safe areas to exercise and play as an important social determinant of health. An 8-year study in Southern California found that children who lived closer to parks had significantly lower rates of obesity at age 18 than those who did not. Chetty, Raj., et al. The Association between Income and Life Expectancy in the United States, 2001 – 2014. Journal of the American Medical Association. 2016.